Today, our earth is constantly being saturated with torrents of blood from wars and various other events. It is also saturated, however, with blood that is more innocent than that of Abel’s: the blood of executed infants. It is the blood of innocent babies—these defenseless children—, which is spilt by their very own mothers. Clinics and obstetricians’ offices have become the “new” slaughterhouses of Herod. Millions upon millions of babies throughout the entire world have been thrown into garbage cans and septic tanks. People don’t even dispose of cats in this way! As we have seen in a startling video documentary, the doctor, obstetrician, and murderer initially kills the child within the mother’s womb using a scalpel. Then with a special instrument, he proceeds to crush the infant’s delicate head, and, finally, removes it. The mother, of course, witnesses none of this and very peacefully departs for her home. A few days ago, I came across an article written by a physician, and I would like to read it to you, as I think it will help you to understand what abortion is from a practical and scientific point of view. The title of the article is: “The Finishing Blow.” I will read you the original text. The article continues: “When the instruments of assassination enter the womb, the fetus senses that something foreign has invaded his environment, and he reacts by withdrawing violently from his natural position. Simultaneously, his heart rate increases from the normal 140 beats per minute to 200 beats per minute. The moment the fetus is struck by the medical instruments of execution, something hair-raising occurs! The fetus stretches his mouth wide open and lets out a silent scream as his life comes to a barbaric end! The producer of the video recording, who is a medical doctor and gynecologist, who performed over 10,000 abortions between 1949 and the present, was shocked when he witnessed this heartrending scene and until then unknown spectacle. He not only decided never to perform another abortion, but also became a leading pro-life activist. prompt the interest of children during their elementary school years in such matters; “open their eyes” early—i.e., before their time; and avoid, supposedly, undesirable mishaps. In reality, however, this system itself will push children in the direction of misfortune. We will say no more. We will only exclaim the following to these women who, as it seems, have forgotten their purpose, and who are determined to uproot everything sacred that God has implanted within them: Is this “democratic” demand you are making humane? We are deeply saddened on account of this plummet and perversion. Do you see how deplorable and grievous the sin of abortion is? Unquestionably, it must come to an end. These innocent human beings must not be assassinated so lightheartedly, on the pretense that one cannot raise another child. Are we going to determine how God should deal with us? Are we going to decide whether or not we will be able to handle all the children that God grants to our family? Will we direct God and tell Him how to take care of us? Day by day, this crime takes on increasingly dangerous dimensions. Women, at last, must comprehend how horrendous it is! They must attempt to stop it, and prevent other women who, under demonic influence, plan to have an abortion, because women usually end up committing this crime due to sheer ignorance, intense family pressure, or an internal personal conflict. The main contributing factor, however, is the devil, who supplies various unsupported reasons, excuses, pretenses, and weaknesses, such as: “there is not enough money … my husband is pressuring me … my health is compromised…” and so forth. The devil takes advantage of all these factors and craftily persuades mothers to commit this grave sin. I am not sure if you are aware of the fact that these embryos, these infants, these beings do not cease to exist once they are aborted. On the contrary! Each embryo is a complete human being, especially with respect to the soul. These children live in the other world, and, as you can understand, many millions of children now comprise an entire army in Heaven. All of them protest. Their innocent blood cries out to God that they were killed unjustly, that they did not receive Holy Baptism, that they did not become Orthodox Christians. Who is responsible for this? It is self-explanatory and does not have to be spelled out. When this blood is spilled, God’s computer documents the crime. How will this blood be washed away? When someone becomes dirty, how is he cleansed? Only with clean water. Likewise, water is needed in this case as well. It must flow forth continuously from two faucets, which are the two eyes. Internal repentance should be externalized with a lifelong, never-ending stream of tears. The sin, of course, is forgiven from the moment it is set forth before the sacred and all-powerful Mystery of Confession, where nothing remains unforgiven. God is love, and “he who abides in love abides in God, and God in him” (1 Jn. 4:16). However, He is also righteous (vid. Ps. 10:7; 88:15). For this reason, women who have had abortions should not feel at ease by virtue of the fact they confessed this sin. They must pour forth tears of repentance throughout the remainder of their life. Many of these women do not feel at peace even though they have confessed. Why? Because they still have not repented internally, they have not shed the appropriate amount of tears required to wash away the blood of the abortion or abortions. Repentance is indeed vast and endless. Our very existence and the fact that man is permitted to continue living after committing such a crime is proof of God’s steadfast love and compassion. Man is still alive: this means that God is waiting for him. Since He is waiting, man must not remain indifferent but take advantage of the opportunity. The penance given by the spiritual father, with respect to this extremely serious sin and specific crime, also requires special attention. The penance serves as an adjunct in the therapy of the soul; but as we have said, the faucets of tears must also be opened. 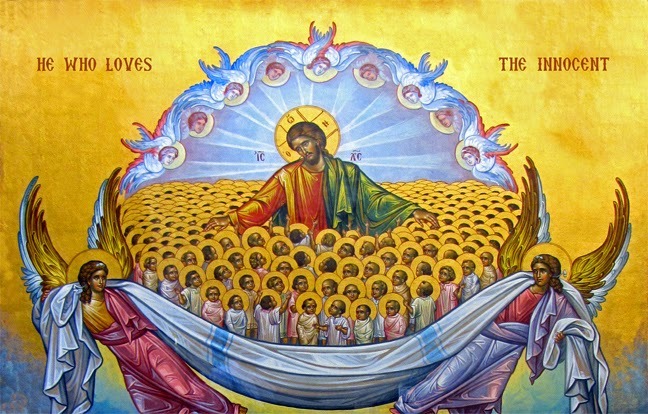 These will wash away the blood of abortion, so that a person may subsequently feel communion with God. Confession alone, therefore, is not enough. What counts, what will change and alter God’s embittered and poisoned heart, what will restore it to its original condition prior to man’s sin, are the tears of repentance flowing from the two faucets of the eyes. Before departing from this life, we must alter God’s heart. I will use a simple example. Let us suppose that a child was disobedient or disrespectful and saddened his mother. When the child approaches his mother and says, “Forgive me, dear mother, for what I did. I will not do it again,” she will reply, “You are forgiven. Don’t do it again.” At that moment, the child indeed receives forgiveness. If, however, he also falls into his mother’s embrace and begins to cry, sob, plead, and beg his mother to forgive him with all her heart, then not even a trace of sadness or bitterness will remain within her heart. This is precisely what occurs with the person who repents and returns to God after committing a particular sin. Some people ask, “Why do people who have repented cry continuously (especially they who have worn the raso, who have gone to dwell in the desert, and who have drawn near to God and devoted themselves to Him), even though they have confessed, stopped sinning, received forgiveness, and changed their way of life?” The answer is simple: the more a person repents, and the more tears of repentance he sheds, the more God’s heart is altered. Profound reconciliation takes place between sinful man and God, especially in the case of this crime of abortion, where an unending stream of tears is required. Tears should not cease until one’s last breath. In northern Greece, at a church visited by many pilgrims and dedicated to a miracle-working saint, people were preparing for a festival. At that particular church, there was a virtuous elderly lady who would light the vigil lamps. She had worked hard cleaning and preparing the church that day, so in the late afternoon she decided to lie down and take a nap before continuing with the remaining tasks. All of us should help prevent this crime. When we learn that someone is contemplating abortion, we should immediately take a firm stand and advise her against it. Usually women who have abortions do not see and are unaware of what takes place within them medically. With the slightest difficulty—it also has become fashionable—they proceed to the physician and have an abortion, as if they are disposing of a dog or a cat. We should dissuade them from proceeding to have the abortion, by telling them that this is the worst possible crime a person can commit. As a spiritual father, I advise the following to anyone who has committed this sin, either once or repeatedly: try to heal yourselves spiritually with tears. To speak in human terms, try to efface the sorrow and bitterness from God’s heart. When a person repents, cries, struggles spiritually, and strives to make amends (all of which serve as a form of asceticism), he softens God’s heart. The great Fathers of our Church declare that repentance can accomplish wonders. It can actually reach the point of completely erasing the recollection of sin from God’s heart; that is, it can completely obliterate the existence of man’s sin. Behold the magnificence of repentance! What then is required from all of us, and first of all me? Repentance! Every time a person says, “I have sinned,” God responds, “May you be forgiven.” Afterwards, we must also proceed to receive the seal of forgiveness from the epitrachelion, through the power invested by the Law in the Mystery of Holy Confession. With the courage we receive from the Mystery of Confession and from the realization of the limitless, unceasing, and continuous power of repentance, we will proceed to the throne of the grace of God (vid. Hb. 4:16). We should not be apprehensive! We should not lend an ear to despair, but rather race toward the Mystery of Confession. Never despair! This is the key! No matter how sinful you feel, never accept despair. Tightly hold on to hope. Never permit yourself to perish by falling into the depth of despair. After having fallen from one cliff, do not jump off another because this will dishonor and insult God’s glory. Exalt God in your heart to the height that befits His grandeur, for He has the ability to erase every sin. If God erased all of humanity’s sins with His Crucifixion, what are your sins in comparison, O sinful man. This is why we accept everyone who approaches the life-saving bath and harbor called confession. This is where every ship battered from the storms at sea sets anchor. Whether it has been beaten by winds, exposed to tempests, or invaded by pirates—no matter what the case may be—it comes and slowly docks next to the spiritual father. It may have lost its mast and sails; possibly all that remains intact is the vessel’s framework. But when it enters the shipyard, all these components are repaired, and the ship becomes new again. Think of how many years had passed. This sin was torturing her, but she did not have the courage to confess it! Glory to God: She left with the hope of salvation. God’s love is awesome! But so is the joy of the angels! “There is joy in Heaven on account of one sinful person who repents” (cf. Lk. 15:7). When a person repents and cries for his lamentable condition, not only does God save him, but also immediately there is great joy in Heaven. All of Heaven rejoices as the angels hymn and praise God for the salvation of an immortal soul! “Blessed are they whose iniquities are forgiven, and they whose sins are covered” (Ps. 31:1). In other words, fortunate is the person who has been counted worthy of having his sins forgiven. What type of gratitude can one express to God? Consider this: I may have lived for a thousand years, I may have committed every type of sin imaginable, I may have been the world’s worst criminal; ultimately, however, God in His mercy may enlighten me. I can return to His loving embrace, and, within a couple of minutes, confess everything. In an instant, I can be justified, washed, cleansed, and find myself in Heaven! What happened to the thousand years of sin? They’re gone! Don’t even think about them! They no longer exist! They have vanished! You are no longer accountable! They were automatically deleted from the demonic memoirs. God has given an order! Every time you deposit a sin before the spiritual father, God presses the delete button on the keyboard, and “click,” the computer registers “forgiveness!” “Click”- “forgiveness and remission!” The grand total is zero. A clean record! How is it possible not to worship this merciful God? How is it possible not to fall down before Him and shed tears of divine love, adoration, and devotion? For this reason, my children, we must pass from the darkness of sin that engulfs us into the light of repentance and hope. When we hope in God’s mercy, we glorify and honor the God of love and mercy. Let us pray with repentance, with confession, with love, and with hope in God in order to advance united, hand in hand, toward salvation. I pray that this small and insignificant offering you have received flourishes a hundred fold in your souls, that it remains deeply rooted within you, that you mark out a new spiritual road, and that repentance always accompanies you. Struggle as much as you possibly can to preserve the purity of your soul and body, because purity has enormous boldness before God. I pray that the grace of the Holy Spirit overshadows and preserves all of us in Christ. Amen.